No, for real, this is how the novel is meant to be read! It came out in eight separate parts originally, and who are we to disagree with George Eliot, the woman so tough she wrote as a man? Plus, this way, we can get into great detail on each section of the book, instead of trying to converse on the whole 1,000+ pages of it all at once. Based on the nature of our discussion, spoilers abound ahead! But so does pure literary conversational awesomeness, so weigh your choices and choose accordingly. The first half of our Part I discussion is here on BookLust, but for the real meat of our discussion, be sure to check out Heather's post on Raging Bibliomania. Aarti: I am enjoying the story so far! That is, I have no idea what the story really is at this point, but I am enjoying the portraits that Eliot is painting of the major characters. This is one of the few books that I have ever started reading without having any idea of the plot. Did you know anything about the story going in, or are you basically going into it blind the way that I am? I also am one of those people who always reads the end of a book before she gets to the middle. This is basically impossible to do on the Kindle, however, which is very frustrating to me. I can’t have any spoilers! Heather: I am also enjoying it, but in smaller doses. I find that some of it is hard to wade through, and am a little unused to the language. It's a lot different than a lot of the classics that I have read, in that it seems less accessible, but when I do get involved, I can't tear myself away. I had no idea what it was going to be about, and still don't. It seems that it's a lot more character driven than plot driven. I think that is something I have discovered very early on. I usually don't read the ending first, and hate spoilers, so I actually like not knowing much about it or being exposed to what the plot developments to come will be. I have a feeling that this is sort of meant to be a story with a point and a lesson, though I have no idea what that will be! Aarti: Anyway, to the book. Like I said, I don’t really know what the plot is. I admit to a bit of relief when the cast of characters grew past Dorothea and her family to include the other inhabitants of Middlemarch. While I like Dorothea and could grow to love Celia, I don’t think I could handle close quarters with the two of them for over 1000 pages. I was really worried when I met Dorothea because of just how religious and self-righteous she is. I just don’t think she’s much fun at all. She is very much the stereotypically perfect Victorian gentlewoman (though the book’s setting is technically before the Victorian era begins), so I was surprised to read Eliot’s narrator discuss how she was not normal, and was too strict and was unlikely to ever be happy because she was too religious. I was very relieved reading that because I realized that Eliot must not be quite as typical a Victorian author as I had feared. So far, though, I like Celia more than Dorothea. I think Dorothea lost me when she said that she planned to give up riding just because she liked it too much and was therefore somehow offensive to God. I mean, really. I can see her becoming one of those Victorians who put weird velvet coverings on the legs of a piano because the bare legs affront her modesty. Celia has that really sharp wit and slightly vindictive turn of phrase that makes her much more human to me. I think even in the course of just the first section of this book, she has become a more confident character who talks back to her older sister, so I’m interested to see where that goes. Heather: I also am glad that towards the end of the first book we met some different characters. Dorothea is sort of tedious, and I laughed at your comment about the piano legs, because I can totally see that! I can't imagine giving up something I love basically just because it gives me pleasure, and I think the whole idea of that is just ludicrous. I am also glad that she is not considered normal in Eliot's eyes. I know that her character is probably based on some stereotypical aspects of the women of that time period, and one thing that I keep thinking is that I am so glad that I don't love in that time period! I like Celia better too, and think that she is the more realistic and winning of the two. So much of Celia's attitude seems to be compassionate and caring, but then again, towards the latter end of the first section she becomes more biting and I think that was fun to watch. There definitely could be some fireworks between the two. I am sad at she doesn't get as much page space as her sister does, but then again, it's probably because this is a story about Dorthea, or at least that is my impression. I also get repeatedly angry that they keep harping on about how women aren't smart, or made for serious thinking, though this I think is a a bit of irony, since the author is a woman, and I think it really does reflect on the times it seeks to capture. It seems that all the men in the story think that women should be beautiful and compliant, but above all, quiet. But then Dorthea shakes this up by being contrary and wanting to learn things that it's not proper for a woman to learn. In one way, I like that she is so zealous about the pursuits of the mind, and that she is so eager to find a teacher, but it's sort of disturbing to me that she is looking at her future husband as such a father figure/teacher. It seems a little weird, but then again, I wouldn't say that she is all that well adjusted. Aarti: Oh, I completely agree! 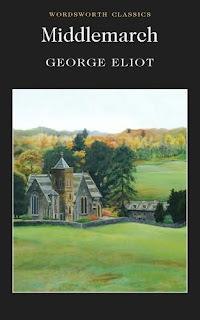 Actually, I believe that George Eliot was really angry at the strictures put on women and actively sought to fight those through her writing (even though, ironically, she published under a male pseudonym). So I agree with you - I think there’s a lot of irony in the way the men view them women and their roles, and the roles the women themselves want to play. I have a feeling that is going to come into greater relief as the book goes on- I can’t imagine that Dorothea is going to be very happy in marriage. So much foreshadowing about that! “I should think you were an uncommonly fast young lady,” said Fred, eating his toast with the utmost composure. AMAZING. So hilariously exactly how siblings talk to each other. I loved it. Heather: I actually was really engaged during that section, and loved the interaction between them too! They are just fun characters and their banter sort of reminded me of some of Wodehouse's writing. It's interesting to hear you say that it rings true. I got the feeling that all the teasing was done with merriment and love, and wasn't spiteful or hateful, which is good too. One gets the impression that they spend a lot of time together, and that their habits are familiar. It certainly seems like they are close, judging by the banter between them. I was actually reminded of the types of conversations that go on between my daughter and son, so I do think it rings true in that respect. Now, mosey on over to Heather's blog to read our thoughts on some of the other characters, Eliot's grasp of human psychology, details on the political situation the characters continuously refer to and our predictions for what will happen next! 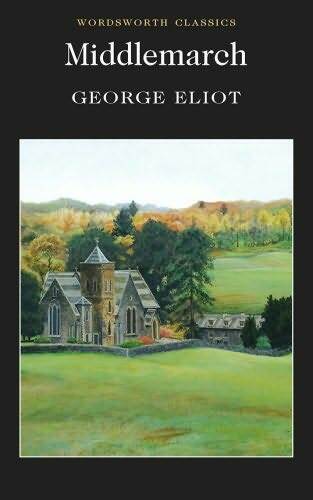 Random comment on Eliot -- for a while in her life (when she was fairly young) she was VERY religious, but as she got older, that turned around and while she had extremely strong views on morality, it was more a "as humans living with each other, we should act this way" view, as opposed to something rooted in God. There's a lot of stuff about mirrors and reflections in Middlemarch. My Victorian lit prof said the passage about pier-glass in chapter 27 is "the key to Eliot's ethics, both in this and in other books ... like Dickens, she's against selfishness. Yet it's almost impossible to overcome it, imperfect as our knowledge is; we cannot help but see the world ordering itself around us even though, in fact, everything in it may be random. Perhaps we need this illusion of order to be able to function at all in the world. It's rare for characters to overcome this illusion, and even rarer for them to succeed, but it does happen at several points in the novel." Dorothea Brooke is amazing. AMAZING I SAY! I find the above comment amazing, because having just reached the last section in Part 2, I am seeing a LOT of selfishness, and even the mention of mirrors and pier-glasses. It is always so interesting to do these reads with you, Aarti, and to see what others have to say to us about our opinions. It's even better when we get some interplay from people who are familiar with the story or the author. Great post, and great comment! I read Middlemarch in 2010 and loved it. Your feelings about the first part echo so much of what I was feeling when I read this section. I felt the same way as the two of you did about Dorothea and Celia at the beginning and I too enjoyed the banter between Fred and Rosamund. There's SO much I could say about Dorothea :P But I'll wait until you and Heather are a bit further into the book, because it will make more sense then. Off to read part two!